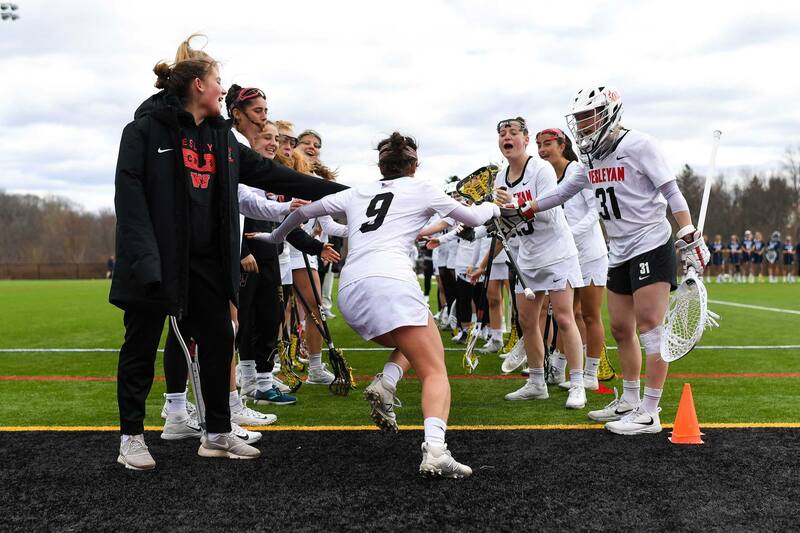 A thrilling overtime victory against Amherst and a claiming of the 2019 Little Three title proved that the ninth-ranked women’s lacrosse team was unstoppable. A 6-2 conference record puts the Cardinals at the leading end of the NESCACs, and the beginning of their season resulted in exciting wins both during and after spring break. What explains this surge of energy from the Cardinals? It all lies in the team’s meticulous preparation for their contests. A tough matchup against No. 6 Tufts broke the team’s five-game winning streak: the Cards dropped the game 17-10. Despite Wesleyan’s impressive record, this loss was not altogether surprising considering the Jumbos’ dominant season thus far. Tufts boasts a perfect record at 11-0, and the team was ferocious in defending its home turf, surpassing the Cardinals with its relentless attacks on goal. Wesleyan put up a valiant effort despite these challenges, with a 7-5 lead at halftime and Abby Manning ’20 scoring a total of four goals. Additionally, the Cards fought back with just 12:40 left in the game, with a goal from Johanna Copeland ’21, assisted by Julia Gretsky ’20, tying it at 10-10. Unfortunately, Tufts struck back with seven unanswered goals, stunning the Red and Black and claiming their victory. This loss hardly affected the Cardinals’ future performances, as they bounced back quickly just two days later to defeat No. 12 Trinity on the road with a final score of 14-6, more than doubling the Bantams’ score. The Dirty Birds got off to a fantastic start with three goals in the first six minutes of the game, wasting no time in establishing their skill. Impressively, the team was able to maintain this momentum throughout the rest of the game. Wesleyan barely flinched when Trinity scored its first goal at the 20:14 mark and subsequently responded with back-to-back goals at 17:50 and 17:09, boosting their lead to 5-1. Although the Bantams came out strong in the second half to approach the Cardinals’ score by three, Wesleyan responded to this pressure by going on a five-goal streak, which ultimately closed out the game. This victory was due largely to Manning’s grand total of six goals and goalkeeper Allegra Grant ’20’s twelve saves on goal. This past Saturday, the Cardinals hosted Bowdoin for Senior Day. Wesleyan honored its six senior members—Amy Breitfeller, Breanna Cavanaugh, Abigail Horst, Emi Ogden-Fung, Caroline Sgaglione, and Caitlin Wood. The Red and Black emerged victorious, barely giving Bowdoin a chance and cruising to a 19-11 win. The seniors especially came out firing that day. Just 45 seconds into the game, Horst tossed a cross-body shot into the bottom right corner. During the game, Horst and Wood scored three goals each and Ogden-Fung added a goal as well. These six seniors have the most wins per class in program history, with a 39-24 overall record, two NCAA Tournament appearances, and two NCAA tournament wins. Horst, Ogden-Fung, and Wood led the offensive line on Saturday, while Cavanaugh and Sgaglione were key in the defensive efforts. Due to an injury, Breitfeller was unable to play. Though the victory appeared effortless, Bowdoin didn’t back down during the game, challenging the Cardinals with four straight goals in the second half with just 8:19 to play. This put the Polar Bears within five of the Cardinals’ score. The four-goal streak did not seem to bother the Dirty Birds, however, as they ended up closing out the game on a 3-0 run. In all these performances, the Cards have showed their ability to tackle tricky opponents with grit, determination, and focus. Their enthusiasm and communication skills shine both on and off the field, with players on the bench equally as lively and energetic as those on the field. This tenacious attitude explains their impressive record. On Saturday, April 20, the Red and Black will travel to Clinton, N.Y. to face Hamilton at 12 p.m. The contest will be the last on the road endeavor of the regular season. The Cardinals will then officially end their regular season with a home game against Conn. College on Wednesday, April 24. Russ has high hopes for the future of the season.